For plants to grow, they must form carbohydrates (for energy) out of carbon dioxide (CO2) plus water, using light as the energy source. This process is called photosynthesis. Although they are called "aquatic plants", most aquarium plants are swamp plants that grow in their natural habitat with at least part of their leaves above the water line, and are adapted to take up gaseous CO2 from the atmosphere. In the aquarium, placed entirely under water, most plants are only able to use the CO2 that is dissolved in the water. In a well-planted aquarium CO2 is in great demand and if not added regularly will become the most dominant factor limiting plant growth. Since photosynthesis uses light as the energy source, photosynthesis only takes place during daylight. Due to the lack of light energy at night the photosynthesis process is reversed so that the plants actually release some CO2 into the water. 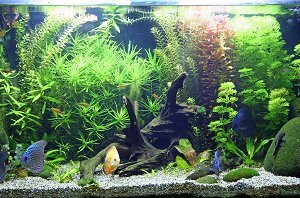 While CO2 is essential for plants, too much CO2 can reduce the pH of the aquarium water to levels that are stressful for fish and therefore CO2 diffusion into the aquarium should be reduced at night. To ensure correct levels of CO2 at all times it is recommended to use a CO2 monitor like the Red Sea CO2 Indicator, which gives an easy-to-read, continuous, qualitative visual indication of the current CO2 level in a freshwater aquarium.